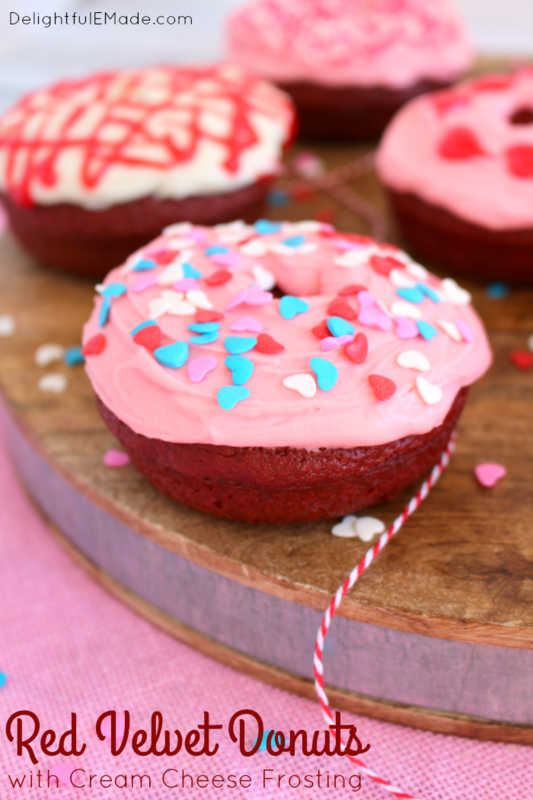 Red Velvet Donuts are the ultimate Valentine’s Day treat! 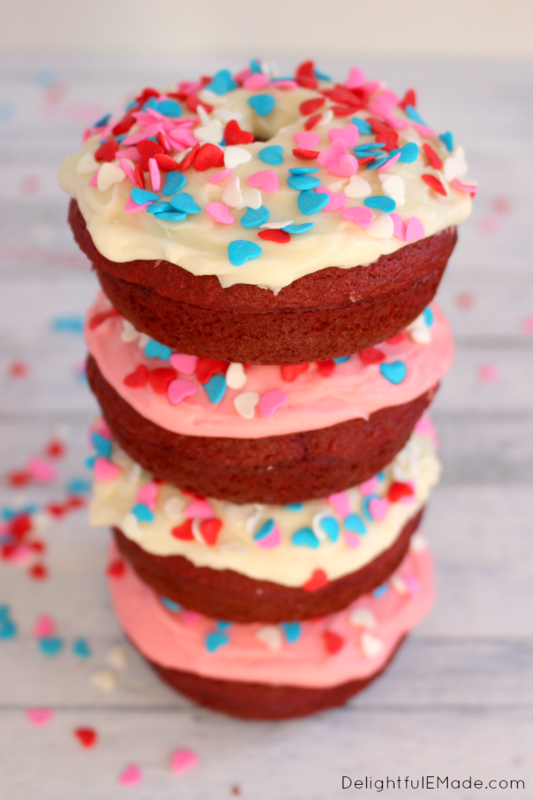 Much like the classic Red Velvet Cake, these Red Velvet Donuts with Cream Cheese Frosting are amazing! 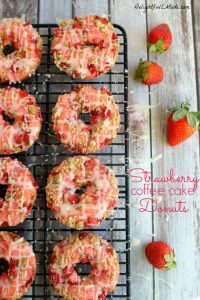 Baked instead of fried, these fun cake donuts are a fun classroom Valentine’s treat, and a great weekend breakfast for the family or sweet workplace snack! Have you ever baked donuts before? A while back I bought a couple of donut pans, and it’s been donut heaven here at our house ever since! 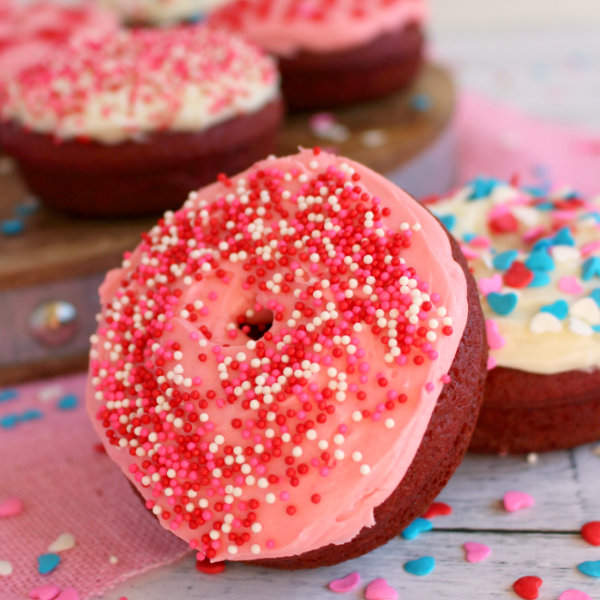 We’ve made several donut recipes and now these fun, colorful Red Velvet Donuts! 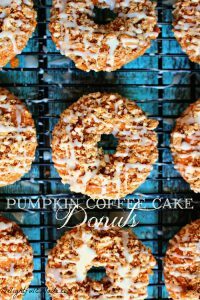 Since this recipe starts with a regular boxed cake mix, making these donuts couldn’t be easier! Making donuts are simple. It’s a matter of mixing up the batter, and adding to the donut pan. I recommend using a resealable plastic bag, adding the batter, and then cutting the end off. This makes the perfect tool for adding the exact amount of batter to each donut. Another recommendation I have is to utilize/purchase a large 12-donut pan, or two 6-donut pans. I started with just one 6-donut pan, and quickly realized I needed another. It helps making the donuts go quicker. Much like the classic cake, I made some creamy, delicious cream cheese frosting to pair with these moist, delicious donuts. Wanna know how to make cream cheese frosting? 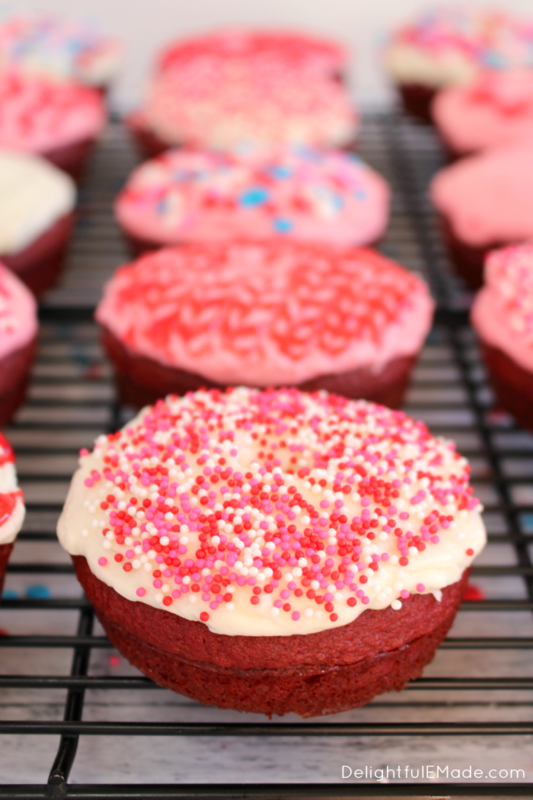 It’s super simple with my step-by-step tutorial for How to Make Cream Cheese Frosting. When thinking this beautiful red cake could make for a great Valentine’s Day treat, I decided to make half of the frosting pink (adding a few drops of red food coloring), and kept the rest of the frosting white. 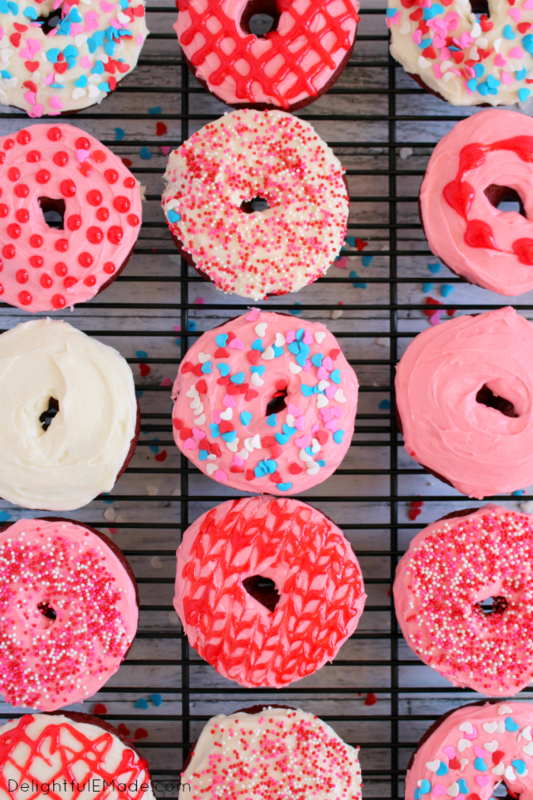 Topping these donuts with pretty Valentine’s Day sprinkles, hearts and gel frosting made this really fun for both me and my 7-year-old. We got creative making stripes, dots, and swirls, too! 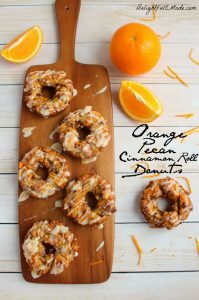 These donuts make for a great treat to take to school for a class Valentine’s Day party, or a nice snack to take in to work. Everyone will be super-impressed that you made these donuts! Perfect to treat your Valentine's, these Red Velvet Donuts with Cream Cheese Frosting are amazing! 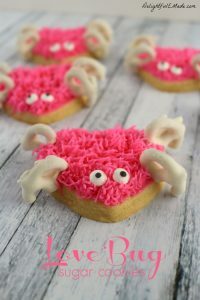 They make for fun classroom Valentine's treats, a great weekend breakfast for the family or even a great workplace snack! Preheat oven to 350 degrees. Generously spray a regular sized donut pan with non-stick baking spray. Set aside. 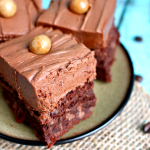 With a hand or stand mixer, combine the cake mix, water, eggs, and melted butter. Mix until smooth and completely combined. Add the batter into a gallon-sized resealable plastic bag. Cut off the tip to make about a 1/2" opening. Pipe the batter into the donut pan, filling each donut about 3/4 full. Remove from oven and let cool in the pan for about 5 minutes. Gently run a knife around the donut to release it from the pan, and transfer to a cooling rack. Let donuts cool completely before frosting. Add the room temperature cream cheese and butter into a mixing bowl. Using a hand or stand mixer, cream together. Add the vanilla and mix. Begin adding the powdered sugar one cup at a time, stopping to scrape down the sides of the bowl after each cup. If you want to color your frosting add the desired amount of food coloring to achieve desired color of frosting. Spread about 1-2 Tbsp. of frosting on each donut. 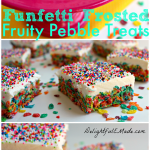 Decorate with colorful sprinkles or gel frosting, if desired. You can also spoon the batter into the donut pan. I've discovered through trial and error that usiong a disposable resealable plastic bag with the end cut off is much easier to get an even amount of batter into each donut. 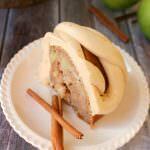 Looks so good and so easy thanks for sharing on Sunday FuNday Link Up. 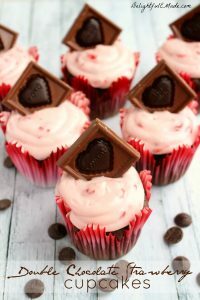 Perfect for a Valentine morning :) Thank you for sharing your recipe with us at Snickerdoodle Sunday! They sound yummy...and almost too cute to eat! I would love for you to come and share this post over at the Really Crafty link party that is live right now! (http://keepingitrreal.blogspot.com.es/2016/01/the-really-crafty-link-party-2-is-live.html). My 2 year old has been begging me for pink or red donuts for a few weeks now. Thanks for this. Now I might just make them for her :) Found your link at Curly Crafty Mom's link party. 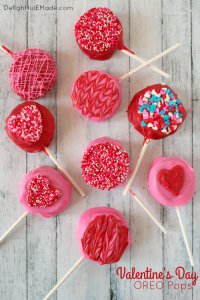 What a pretty Valentine's Day treat and of course the color is perfect for the holiday! 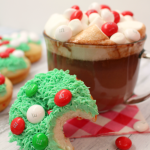 Yum these look amazing! I love donuts and cream cheese frosting. These look absolutely delicous and colorful, love love love. You'll be featured at this weeks Throwback Thursday link party! Hope to see you there. These look amazing!!! I might have to make them for Valentines Day. Thanks for sharing!! Great Post! What pretty donuts! Thanks for sharing at the What's for Dinner party!